Parent company Lance, have used exactly the same bag design for the Tom's Potato Chips range. A great use of colors. The white on the top half really makes the giant logo stand out. Although we are not ordinarily fans of huuuge company branding, this works - it works with brand recognition by making it part of the design rather than just plopping a big logo on the bag. The secondary color represents the flavor color coding. The separator image of the bag's contents also works well. We would have preferred a better font or some individualism for the flavor wording. These Chips had a firmer crunch than many standard thin Chips. A handful did not instantly turn to mush once it was popped in the mouth, like some Chips do. These were regular, standard looking Potato Chips, if a little lighter, golden yellow. There were some broken and oil bubble crushed Chips in the bag - although most were complete. There were some slightly see through oil patches and a few brown edged colored Chips. 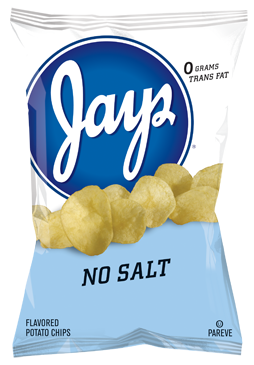 This is a repeat of our review for the Jays Original Flavor: We will openly admit we are not the best at reviewing plain Chips. In the UK they call them Ready Salted. The customers call them Ready Boring. We kind of agree. These did have a warm potatoey flavor, which makes them good company for a funky fancy sandwich. Although relatively low in sodium, if you are going to eat a salty snack, it makes sense to have one with flavor - no?